Penny comes to PrimeCare with a broad background in administrative and technological fields. 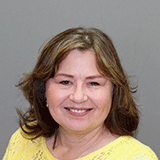 Penny has vast experience in an office setting, most recently as a Medical coding and Billing Specialist. She also Medical Transcriptionist experience and EMR knowledge. Penny received her Medical Transcription training at the Segal Institute in Dunedin, FL, and her Medical Billing and Coding education at the Eaglegate College in Murray, Utah. Penny earned her CPC-A Certification in 2017.